Car shopping: A better way? TrueCar founder Scott Painter says his online service helps consumers decipher the true cost of a new car. FORTUNE -- You can divide the automotive universe into two categories: those who paid too much for a new car and those who think they did. Such is the maddening process of visiting dealers, deciphering their "real" cost, and negotiating the labyrinth of fees. 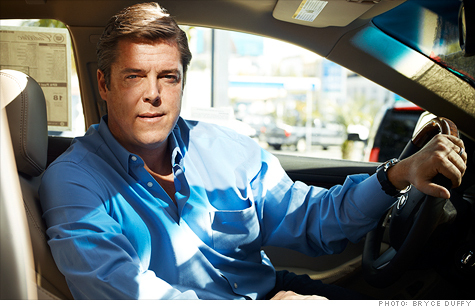 Revolutionizing the MO of car buying is the crusade of Scott Painter, the 43-year-old founder and CEO of TrueCar.com. Starting Jan. 1, his website will become Yahoo's exclusive partner for car shoppers. TrueCar is a free online service that tracks actual purchases of new cars. Unlike other car sites, it collects information from various sources in the transaction process: insurers, lenders, government records, and the 5,400 brick-and-mortar dealers in 49 states that participate in TrueCar's network. From these data, TrueCar determines average prices for any model in a given area in the past month. TrueCar's best graphic: Plug in a vehicle model and zip code, and TrueCar creates a series of price charts showing the range of what people have paid -- and where those prices fit on an ascending continuum from Dealer Cost to Average Paid to Factory Invoice to Sticker Price. You can then negotiate knowledgeably with local dealers -- and if you want price quotes from dealers in TrueCar's network, just click a button. Painter says the average savings for a TrueCar buyer is 9.7% off sticker price. Sometimes, where dealers have too much inventory, many buyers have paid less than dealer cost. "There's an average 25% range from top to bottom on what people pay for a commodity -- the exact same car," Painter says. "Buying a car should be more transparent. You don't have to trust the dealer anymore -- trust the data." In its revenue-sharing deal with Yahoo (YHOO, Fortune 500), TrueCar will pay a minimum of $50 million annually for three years to Yahoo, which in turn is guaranteeing 10 million unique visitors a month. He says he expects the Yahoo deal to triple the $100 million in annual revenue TrueCar says it's generating. The company makes all its money from actual sales it generates through its network. TrueCar receives $300 a vehicle from dealers. Painter says TrueCar's profit margin is in the "double digits." Much of its current revenue comes from powering other online auto-buying programs run by such companies as American Express (AXP, Fortune 500), Geico, and Consumer Reports. Painter has long been a car buff and a serial entrepreneur. He launched his first business at 14: a "Tom Sawyer" car-detailing service in which he got other teenagers to do the cleaning and he drove the cool cars around the backroads of central California. He started another automotive business after dropping out of Berkeley -- and before that West Point. His house in the Bel Air section of L.A. has a nine-car garage. Alas, he couldn't always use his own service: He was Customer No. 1 on a $220,000 silver 2011 Aston Martin Rapide. There's no TrueCar chart for that.